​The first thing you always notice is the colour. Nobody does blue like Suzuki. Yamaha try, but they just miss the mark. The second thing is that exhaust. Ahhh noise regulations; keeping aftermarket exhaust manufactures in business for years. As is so often the case, you approach any experience with a preconception and I'd heard that Suzuki sportsbikes all had narrow bars and that they were fast. In short, only one of those is true. A little hint, it's not the bars. When riding at slow speed, the bike is pretty much the same as anything else I've ridden. Its fairly civilised with only a slightly lumpy response off the throttle in the lower gears. Having ridden a Ducati for so long, I'm used to slipping the clutch should it be needed, so its not the end of the world for me. Heading out of town and picking up speed I was a little surprised by an apparent lack of serious acceleration when twisting the grip. I soon realised this was just me and twisting a little further revealed the real reason you would own a GSX-1000R. This is a seriously fast motorcycle! The riding position is roomy, with the bars feeling, well, fairly normal. Its reasonably thin too, so some Stomp grips would possibly help, and the mirrors are fairly decent. The real star of the show is the factory spec quickshifter. Its faultless both up and down the box. Accelerating hard out of and through the bends, riding the gearbox, the bike felt stable and just kept on pulling. When slowing for some tighter stuff, a few clicks down and we were ready to go. Super easy, super effective and a super addition. Its a fabulous bike to ride. Beautifully balanced and easy to turn. I had the front go light on me a few times over the bumps, but it quickly regained it composure as I pushed on. The controls are easy and right where you expect them to be as well. The dash has lots of information and in an age when the competition is rolling out full colour displays, this did seem a little behind the times. In reality though, the only information you need to see if your speed when you see those big yellow boxes on the side of the roads. For that, its perfectly easy to read. As I mentioned previously there is no mistaking this bike for anything produced by somebody else, but its design left me a little cold. Suzuki have stuck with their tried and tested design and you can see all the design cues that hark back to the K3 bikes, especially the style of the nose. Both Yamaha and Honda have introduced radially different looking flagships, but the Suzuki does feel like more of the same. If I had one I'd spend a few extra quid changing the exhaust, which when on song, actually sounds okay, and fitting a tail tidy. There is a very smart looking bike under here and it won't take too much to find it. I'm not saying this is a bad motorcycle. Far from it, its pretty flippin epic actually. Civilised and easy to ride in town and extremely easy to get into trouble on when out in the wild. If Suzuki were able to introduce a bit more character, or have made the bike stand out from its predecessors a little more, for me it would really be pretty faultless. This is without a doubt, the quickest bike I've ridden so far and if you're after a bike to ride and enjoy, the GSX1000R is certainly worth spending some time with. So I finally got spend a little time on the 2017 Fireblade. Lets get this out of the way, its a lovely thing. Getting off my 954 onto the new bike was interesting. The new bike is certainly thinner and has a much smaller, compact cockpit. Friends had mentioned that they felt the bike was small, but it didn't feel that much smaller and certainly no thinner than the 1098s. The riding position felt familiar, but with a fraction more weight over the bars than I was expecting. Before I started the ride, I felt my 954 was a lovely smooth easy to ride bike. Even when pulling away I could tell just how smooth the new bike felt under acceleration and the 2017 really shows what 15yrs of progress has done. I know reading that back, that it sounds strange, but the 954 has been seen by many for so long as the perfect Blade. The bike I tested came with an optional quickshifter and a Yoshimura after market exhaust, making it sound extremely angry, even at tickover. This, dear friends, is not a bad thing. Riding through town was as easy as you would expect, with the only real thing of note was just how hard the bike felt to turn at slow speed. Out on the fast sweeping bends of my local area, this problem disappeared as quickly as the traffic behind me as I got the bike out into its natural hunting ground. The bike fell into turns beautifully and predictably and when selecting full power from the options menu (something, as an analogue rider, I still find equally amusing and baffling) the bike felt sharp and effortless. Unexpectedly the bike demonstrated a few little quirks. When at 'below walking pace' the engine would pulse like I was tweaking the throttle, but this didn't transfer into forward movement. The engine breaking felt artificial as well and this all depended on the modes and the settings. Being used to two bikes, one with loads of engine breaking, the other with little, I really noticed this and it took a little getting used to. The mirrors are okay, but nothing to either make or break the deal. What was cool though was I was able to change through these engine modes when moving, or so it seemed. I tried out the different settings after stopping the bike to see how it effected the whole experience, rather that relying on changes while on the move. I'm sure there is a real sweet spot for every rider on this bike, however, you don't look to own a bike like this, only to cut it's legs out from underneath it. I can understand altering the level of traction control you are getting, but being able to alter the engine characteristics is, well, a bit unnecessary in my opinion. If its wet or you want to be cautious, you just don't twist as hard surely. I do however understand that from a manufacturer point of view its a good thing though and every new bike on the market has a similar option so this is a problem with me and not the bike. So would I buy one? I certainly wouldn't be unhappy with one in my garage. As I said at the start, its a lovely, lovely thing. I know that a test ride is miles away from the feeling and experience of ownership, but with the development cycle of sportsbikes now being closer to ten years than two, Honda have got an amazing base setting for what will surely become something truly special. 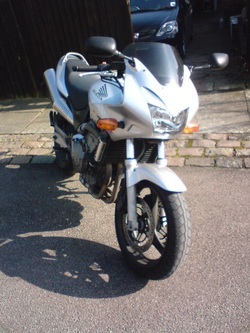 Here we have a 2004 BMW 650GS which I rode around for a week while the FireBlade was off the road. The spec sheet says that this is a suitable all rounder with a good riding position and a punchy little single engine, perfect for friendly, unhurried riding. What I found was a tall, gangly, weak and dull motorcycle. Maybe I'm used to bikes which have a bit of acceleration as soon as you ask for it, even the 695 Monster delivered there, but this seemed so slow in comparison. The effort it took to get to speed was only matched by the effort it took to slow down, with just a single disc at the front giving the bike more of the off road feel, which its clearly aimed for. With only five gears on tap I kept searching for another because, despite my previous statement, it would get to the speed limit eventually, but was so buzzy and vibey by the time you got there, I just wanted to choose a better ratio. The riding position wasn't to my taking, with all my weight being put through my bum and feet. There was no way to brace myself with my legs, but I will admit I was wearing textile trousers which just slipped along the fake tank. I found this strange as surely most 'adventure bike' riders wear textiles and not leathers. Leathers its turns out, were also the wrong cut and wearing them made my arms ache as the bars were so high. The suspension was okay is, but just too spongy for me, again, I'm sure this is an 'adventure thing', but on the road, where no doubt 95% of BMW adventure bikes end up it just wallowed around. The tyres, semi-knobby ones gave only one feeling from the back and that was one of vagueness which didn't fill me with confidence. Its not all bad news though, mirrors were good and it sipped fuel, apart from that. Not for me. Today I got to ride this beast of a bike. It a 1995 BMW RT1100. This bike represented a few firsts for me. It the first BMW and out and out tourer that I've ever ridden and is actually the oldest bike I've ridden too for what that's worth. After the disappointment of the TDM a few weeks back I let me eyes dictate my feelings and I looked at it as just something to get me home. I was a little concerned about its size too, however even from low speeds the bike was perfectly balanced and hid its weight well. By no means sportsbike fast it could certainly hustle along and was very easy to ride. The riding position was very upright and having read about it during numerous tourer group tests, I got to experience the negative pressure that bikes with big high screens can cause. A very strange sensation, the pressure actually pulls you forward and down into the cockpit. The brakes were okay if not amazing, but they were slowing down a big old barge of a bike so that can be forgiven. It has loads of features like ABS and a radio! A flippin radio. Not bad for 1995. If I still needed to ride up and down the motorway for work then I could do a whole lot worse than this. Powered with a full on drive shaft, the bike trundled along and just to test her out a bit, I took her down the awesome Wimborne to Cranborne Road, which is one of the best roads in Dorset. The Beemer took it in her stride. A great piece of kit. Now I've read good things and I've read bad things about the TDM. TDM by name, tedium by nature being a prime example of the negative comments. Now, as we know, I don't really have a huge amount of experience when it comes to tall rounders, preferring either Super Nakeds or Sportsbikes and this 2002 bike is actually the second such bike I've ridden. 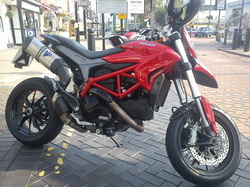 I've briefly ridden a Multistrada too, which was actually quite nice. 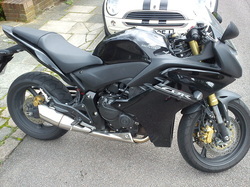 I don't know if it was the bikes age, tyres or even the screen, but this has to be the worst bike I've ever ridden, replacing the previous owner of that award, the FZ6. It was just horrid. The engine was gutless, the brakes not very sharp, the screen meant I was being buffeted around and the wind noise was terrible. It's clearly the ugliest bike I've ever seen and the riding position, although comfy, was like being on the throne. The mirrors felt so close that I felt a bit cramped, despite having what felt like five feet of space between me the the dials. This could be because I'm used to mirrors being way forward on the fairings though. All in all, I cannot really recommend the TDM as anything but winter transport. I didn't gel with it and couldn't wait to get my FireBlade back, which felt like a scalpel in comparison. Yes I know these are two different style of bikes, but they are the same age and despite this, the Blade felt six years younger that the TDM. Whilst the 'Blade was being worked on, I was able to take a Monster 821 out for a spin. As you would expect, its very much a 'Monster'. The engine is fantastic, quickly picking up speed when needed and the exhaust note is highly addictive. The bars are nice and high, but the riding experience was really ruined for me by the restrictions of the pedals and footrests. Due to the casting of the rear foot peg hanger and the exhaust, it seems impossible to pull your feet far enough back and ride with the balls of your feet on the pegs. Its not a problem when needing to change gear or use the rear brake, but the problem arises when wanting to put your feet into a more relaxing riding position. Shame really as the rest of the bike is faultless. I took this out for a spin on a glorious Autumn afternoon in October. Following the theft of my ZX7-R I was looking for a bike to commute/ride through the winter on. The Hornet had recently come in as a trade in and if the price was right, it seemed like a perfect fit. On the ride it was clear that I loved the engine and the raspy exhaust note that accompanied it. The riding position was very roomy and the seat comfy. However I really didn't like the vagueness of the gear lever, the excessive length of the clutch travel and a terrible vibration from the bikini fairing at 5000rpm, which ironically is just where the engine seems happiest. The bike is basically the same machine as the CBR600F , a bike which I quite liked. I would like to ride a 'fresher' one, maybe with around 10,000 miles on the clock as this bike had over 30,000 miles showing and it was clear that the bike had been used in all weathers. As a winter hack, this bike would almost be perfect, but for the price that was being asked (which was below the actual value) I felt there were still better options available. 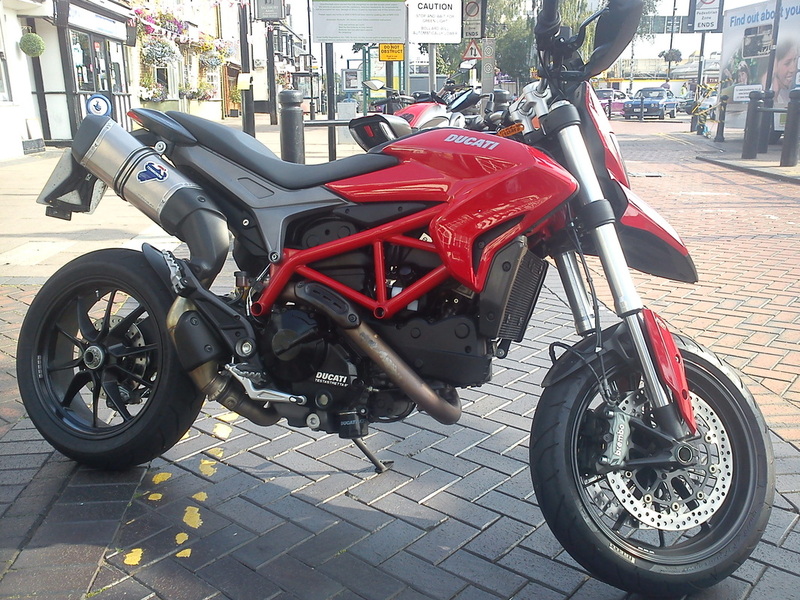 The Ducati Hypermotard is the tallest bike I have ever ridden. I'm 6'3 and I was almost on tip toes when I came to a stop at the lights or when filling up for fuel. The engine, an all new 821cc Testastretta unit is very flexible and delivered its power nice and quickly when pulling away, but I found it ran out of any real puff when nearing the 90mph mark. This isn't such a bad thing when you look at the design of the motorbike, evident by the size of the fly screen on the clocks. This is not a bike to be thrashed down the motorway, but more one designed for flicking through country lanes and diving around corners. At lowish revs the throttle seemed a little snatchy, which complicated things a little when wanting to hold a constant throttle through some of the faster bends in Hertfordshire, but I didn't notice any of these type of problems when powering out of roundabouts or picking up and driving through the power range. 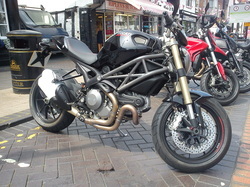 This bike came with an aftermarket Termi exhaust which gave the bike a very distinct sound. The riding position was very forward with hands attached to very straight bars. The brakes were good, which is to be expected and the clutch was a lovely light affair. I was thinking whilst riding around if I would like to own one and I think I would, but only as a second bike. There are a few little niggles. Its not even remotely practical, has the aforementioned problem with a snatchy delivery on a constant low throttle, but the biggest niggle is the old fashioned filler cap that comes completely away from the bike. I, like many if not all of UK bikers, cut their teeth on naked motorbikes. Ironically after learning to ride, my first bike was the half faired Hornet, but I have always liked naked and especially super nakeds. The 1100 Evo is, at the time of writing, the most powerful Monster in Ducatis range and it looks the bees knees, especially in black. For me, there wasn't any problems reaching for the flat bars and there was plenty of room for legs and bum. The Monster really is a bike that loves attacking corners and its very easy to hold a desired line. The Monster has always interested me, but seeing as I have a Superbike in my garage the idea of riding the smaller 696 or 796 didn't really appeal. After the ride I was left feeling that even the 1100 needed more power. Yes it was reasonably fast off the line, but at the top of the rev range and when speeds started getting about 80mph, I found the bike struggling for any significant shove. Maybe I was spoiled by my previous experience with the Diavel, which to me is just a Monster on steroids. That has loads of grunt and I was left not wanted any more power at all as it sat quite easily in the three figure bracket. During the ride I also noticed just how vibey the Monster was, especially through the footpegs. Like all naked, super or otherwise, their natural habitats are either the City or the back lanes, where they provide excellent entertainment and practicality. Would I buy one? Probably not. 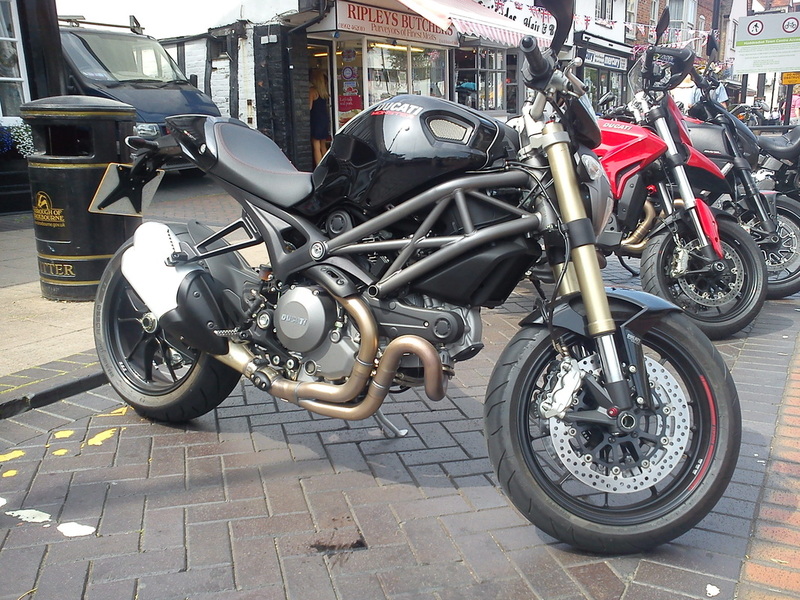 If I wanted that Super Naked fix and wanted a Ducati badge on the tank, I'd be looking towards the Diavel before I look at a Monster, which is a bit of a shame. From the start, let me be clear. 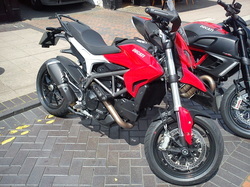 The Hyperstrada is mechanically identical to the Hypermotard. The only differences I could spot where a deeper more sculpted seat, a large clear screen and mountings for the panniers on the rear sub frame. The thing that made the most difference was that seat. It puts me a lot lower and further back on the bike which helped, or should I say allowed me, to move my feet a little further back when riding, which made the riding position a little more practical and comfortable. The whole point of the Strada range is to provide bikes to go touring on and cover some big miles. Sadly, for this purpose the seat and tank range are a bit small and the amount of weather protection is nominal at best. A bad bike? Not at all, but there are much better options within this class, even within Ducatis own range that are much better suited to the purpose. I have to admit, I'd been wanting to ride one of these since they came out just short of two years ago. Today I had to test a route that is going to used by my local Ducati dealers for a forthcoming event that they are taking part in. I was originally going to just run the route on one of my bikes, but I thought, seeing as I'm out, I may as well have a test ride. The Diavel has always been a strange one. It seems to be the combination of three bikes: a Super Naked like the Monster 1100, a muscle bike like the V-Max and a Superbike like the 1098/1198/1199. Each family of bike lends large chucks of their character and what you end up with is a really big Monster, with Superbike power and a relaxed riding position which includes very relaxed foot pegs. The seat is very comfy and I found the bars were within really easy reach. Sitting 'in' the bike you notice there is an awful lot of bike out in front of you, which in turn makes you forget just how much isn't behind you. Pretty much the only thing back there is the rear wheel, which in turn dominates the handling. The bike goes where that wheel wants to go and as the rider, you just have to wait a little longer in the turns. Its really only a fraction, but coming off a Sportsbike you really notice the pause. The soundtrack from those exhausts, again mimicking those found on the side of the 1100 Monster, is all growls and burbles, which really suits the machine. During my test ride I felt that the indicator switch is too high and it took a bit of getting used to. Very little movement with a big button in the middle basically. I didn't explore the three different riding modes, leaving it in Sport as today was dry and the roads were clear. 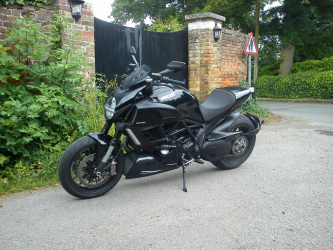 The Diavel is an incredibly quick, stable motorbike at speed, but its also fun when it gets twisty. For the first twenty minutes I didn't really like it, but by the end of the ride I loved it, but the big question is would I buy one? I really don't know. At the moment probably not, but if I had to do lots of miles spending a good 90mins in the saddle each way, I guess I could be convinced. The more I think about it, its the perfect bike for a blast. You don't need to dress in full leathers as all you really need is a nice pair of draggin jeans, a timeless leather jacket and a tenner to buy a coffee and a sarnie along the way. 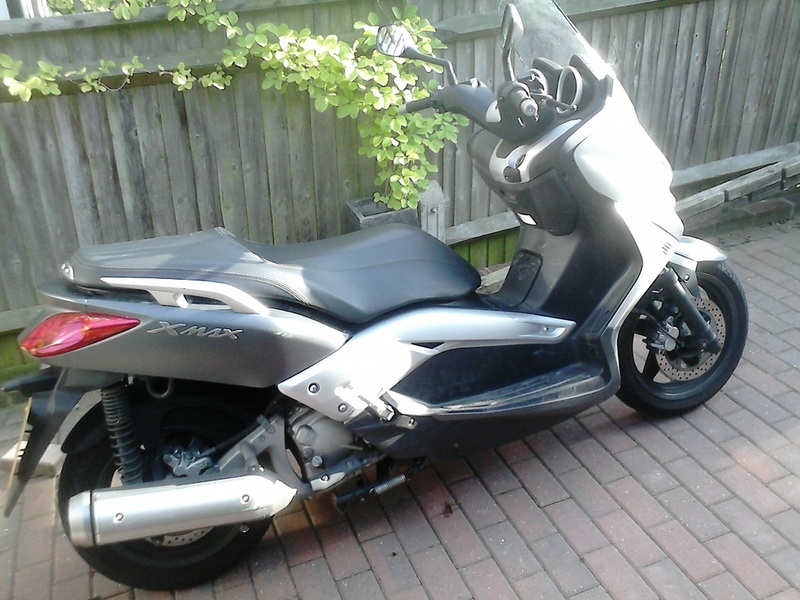 In a somewhat unexpected turn of events, at the end of August 2013, I found myself in the company of an X Max 250 scooter which I was using to run into and out of Central London getting me too and from work in the morning, whilst the Ducati was in the shop. For the first few days I felt really overdressed in my leathers, so ended up wearing normal jeans with the jacket, boots and gloves instead of the leather Alpinestars I usually equip my legs with. Now, I'm not a fan of scooters and I never have been. I consider them to be like the mosquitos of the road network, always buzzing from place to place with seemingly no concern for any other road user(s). After riding one, I have a much greater understanding of why. The controls are incredibly light allowing for quick and easy changes of direction. Visibility is very good and that big screen provides a fair amount of wind and weather protection, although the wind noise does increase somewhat. All the buttons work excellently, with a nice positive action that removes any thought that you may or may not have selected the desired function. The seat, well the seat is very comfy, but I found that my lower back complained a little earlier than normal, as its almost impossible to take any weight through your legs or arms, and well, I'm a heavy man. Whilst we're on the seating position, you can either have your feet out in front of you, a bit like on a Harley, or you can have them straight down, like sitting on the loo, but the bodywork doesn't allow you to have your feet tucked behind you, which for me, as a sportsbike rider, is the most comfortable. Under the seat you have enough space to two, yes two full face helmets (they even have little templates to help support your lid when parked) and there is a nice little lockable cubby whole under the handle bar(s). 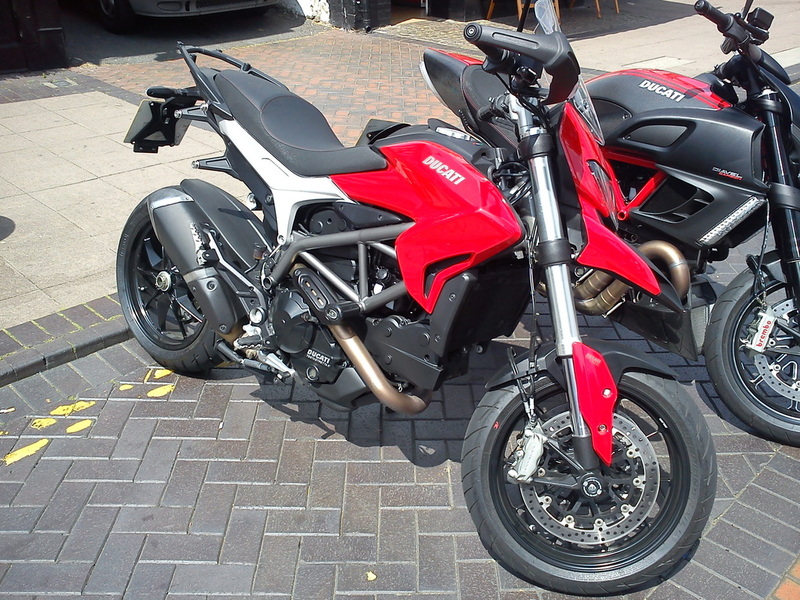 Now I like a bit with character in my bikes, which is why I ride a Ducati and this provides the biggest problem for me with the X Max, in the fact that it is utterly devoid of it. It is so quiet (in comparison to anything else I've ridden) that when wearing ear plugs, I can't even hear the thing. Looks wise, I think it looks hideous, but what the X Max is, is a true triumph of function over form. As 'transport' it does everything you could ever want it to do. It will get you from A to B in reasonable comfort at a reasonable pace. You can carry your shopping, pretty much all of it, under the seat in perfect safety. Do I want one? Nope, its just not my kind of vehicle. In my life I've ridden three Yamahas and neither have set my pants on fire. I really need to ride this scooters much bigger brother the V Max, the R6 or an R1 before I completely give up on the marque from Hamamatsu. This is where it all began. 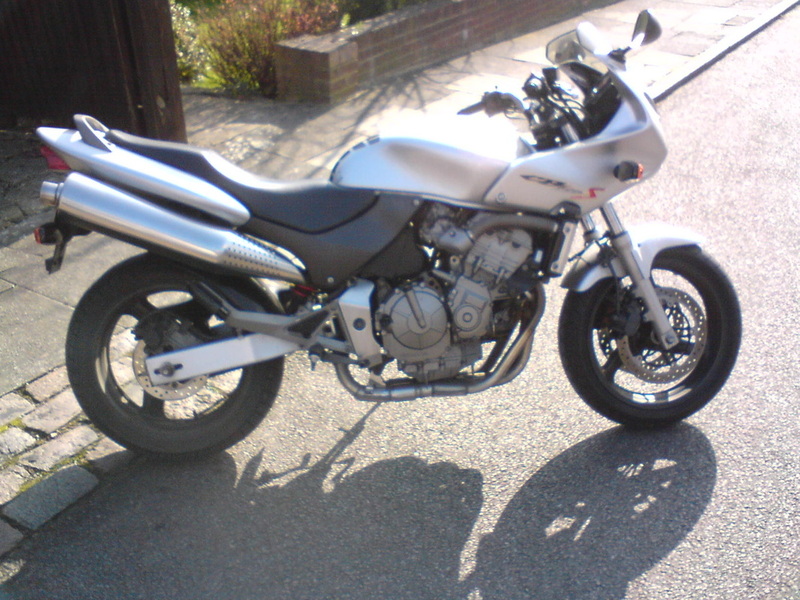 This was the first bike I bought after passing my test and it felt massive compared to the 500cc Suzuki that I passed my DAS test on a few months previous . It cost me £2000 and my mate Greg helped me pick it up one cold, frosty January morning. I managed to go 11 months before coming off it the first time, giving it a few battle scars in the process. I used this for my first road trip, which was four days riding around the South and South West of England, meeting up with friends and just exploring really. One day on the trip, riding from Bournemouth over to Exeter to see Jo R, it rained so hard by boots filled with water. I got so cold on that journey that I was amazed by how much warmth I could draw from the light bulb above the table in a roadside cafe just outside Honiton. With a really really relaxed riding position, pretty much straight backed, the Hornet was the near perfect first bike. The 600cc engine was powerful enough to appreciate, but not enough to truly scare me. The tank was metal so I could use a tank bag and the half fairing kept most of the weather at bay. I learnt a great deal riding this bike and was very much saddened when it was written off as a Cat C after being taken out by some dozy old boy in a golf. It passed onto my teacher at Waltham Forest college, who fixed it back up, rode around on it for a few months and then the git sold it. Which was especially annoying because if I'd known that, I'd have bought it back off him. 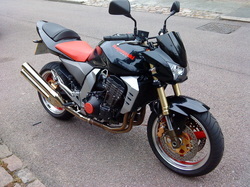 After the Hornet, my next bike was the Z1000. I took this out for a ride when my Z1000 was in for a service. It was the first real sportsbike that I had ever ridden and for the first hour, I was shocked at the riding position, but this was down to me having only ridden bikes with a very upright position like the Hornet and the Z1000. The bike was elegant, refined and wonderfully built, but when you opened the throttle, it was a pure rocket ship. I had never experienced anything so responsive in my life. It tipped into the turns with the slightest of inputs and the power came on with such a smooth progression, that it felt utterly controllable. I will never forget my first ride on a superbike and if I had the money I'd have one in my garage right now. A beautiful, wonderful, life changing machine. Even if it did have orange trim. After driving into work for about two months following the demise of my Hornet, I was wondering what bike to get next. I'd considered GSX-R 600s, the CBF1000, the Ducati Monster, Triumph Sprint even a ZX6R but for whatever reason I could't afford them, or couldn't find one. I was sitting in traffic and a Z1000 rolled past me and I was immediately taken with the shotgun exhausts jutting out of either side. That day at work I had already started scanning the web to get reviews and prices. Thankfully it was within budget and I had found one, but it was in Oxford, some 50+ miles away. I called the dealer and arranged a test ride. It was priced up at £3200 but looked awesome to me, despite being surrounded by GSX-Rs and RC8s in the dealership in Didcot. It wasn't long into that ride when I realised that I wanted it and 30mins later I had arranged to pick it up the following Monday after work. I did my first trackday on the Z1000, a valentines day present from Sarah, on a very very cold February morning at Brands Hatch, followed by three more that year at Silverstone, Cadwell and Snetterton, where it survived a 120mph lowside at the end of the Rivet straight. The only damage being a dented tank and a shaved engine casing. I finished the next five sessions and rode it home. It didn's miss a beat. I modified it a little, adding a belly pan and some bar end mirrors to replace to bunny ear ones it came with, but left the exhausts as standard, I just really liked them. This bike is also responsible for meeting the love of my life. When up in Didcot to test the bike, I had called my friend Neal, who was working around the corner and asked him if I could pop by and say hello. When I got there, I was greeted by this stunning brunette who was stuffing her face with ravioli. That was over three years ago at the time of writing, and I couldn't be happier. All good things must come to an end and it did on a cold March morning of 2010. I was heading into work just before 05:00, southbound down the A1 in Holloway, London. A minicab driver who wasn't paying attention pulled right across my path into a petrol station from the northbound lane. The bike and I had no chance. I thought I was going to die as the bike thumped into his front wheel, sending me over the bonnet and into a parked car. I folded the bike under the tank, snapping the frame. The front wheel was embedded into the radiator and the impact had snapped off the rear shock. I hadn't faired a lot better as I'd fractured my left ankle in four places, dislocated my left shoulder, fractured a knuckle in my right hand and snapped a tendon in my left. Every cloud has a silver lining. I survived, it made me a better rider and hopefully a better person. Two weeks before the accident I had bought the Zx7R as a track bike, but now she would be called upon for daily duties as I planned on using the compensation money I received for something very special indeed. The Ducati I had wanted since I first started to ride. 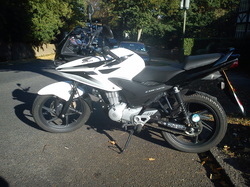 After riding around on the YBR125 for three days, at North London Motorcycle training http://www.northlondon-mct.co.uk/ I moved up to the GS500. I can still remember thinking that it was so much more powerfull that the Yamaha. Even the exhaust note sounded cool. Looking back now, I see the bike as a basic, crude learning tool that I never want to ride again. I could't have done it without it thou as this was the bike I passed my test on. Next stop the Hornet.